Two things happened in New York Yankees news this past week, Yankees owner Hal Steinbrenner said “Fans should keep an open mind that I’m never done until I’m done, and that’s usually not until opening day,” and PECOTA released its 2019 projections for players and teams ranking the Yankees at the top of the American League East. I’m not claiming there’s any connection between the two events, just noting that the Yankees are already slated to be very good and Steinbrenner suggests they may not be done. Projections are not predictions, but it’s fair to say based on these numbers that the Yankees and the Red Sox will be battling it out at the top of the division without much interference from the other three teams in the AL East, with the exception of the Rays, who may surprise again with a strong record. Free agents Bryce Harper and Manny Machado remain unsigned with 5 days to go until pitchers and catchers report for spring training. While the Yankees have had talks with both camps this offseason, as fans know, nothing but rumors have been the result. 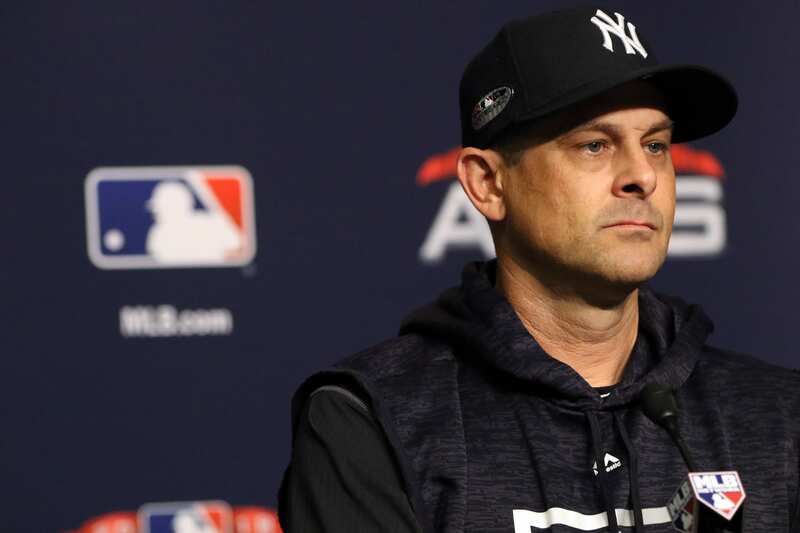 On Monday at the Thurman Munson Awards Dinner, Yankees manager Aaron Boone, in fact, stated that the Yankees were a “complete team” now and ready to compete for a championship, thus appearing to put to rest any lingering hopes from fans that the Yankees were not finished building this offseason and might sign one of these two extraordinary talents. Thus, the excitement when I read that PECOTA projects the Yankees to be tied for second (Dodgers 96-66 also) with the best record in baseball behind the Astros, projected to have a 99-63 record – and they are potentially still interested in adding pieces. The Yankees are very good on paper going into the season, but the arguments have definitely been made that the addition of Machado or Harper would significantly increase their chances of a championship in ’19. We’re fast approaching spring training and fans are eager to see the team make a spectacular move which will propel them beyond the projections and into the record books.